Kapiolani Community College Farmers market, one of the most popular farmers markets on Oahu. On the island of Oahu, there are places visitors can sample the freshest produce from local farmers. Here, they can also view the works of some of the best local artists and craftsmen. And tourists can do all of this at the farmers markets on Oahu. The Kapiolani Community College Farmers Market is one of the largest farmers markets on Oahu. It’s on the north side of Diamond Head crater. Here, sample kalua pig, fried rice and garlic shrimp before you head to the flower and fruit booths. The vendors open from 7:30 am to 11:00 am. So the earlier you arrive, the greater the selection will be. Besides being popular among local residents, this market is a major tourist attraction. It’s also in a very convenient location near Waikiki. Open on Wednesday evenings, the Honolulu Farmers Market is next to the Blaisdell Concert Hall, It’s a place where visitors can stock up on scrumptious dishes. And then they can have an impromptu picnic on the large lawn area. Another great option is the Fort Street Mall Farmers Market. It’s open every Tuesday and Friday from 7:00 am to 2:00 pm. People know it for its variety of fresh fruits and local dishes. This market is a good place to grab a takeout lunch in downtown Honolulu. You can find the King’s Village Farmers Market in Waikiki. It’s open on Mondays, Wednesdays, Fridays and Saturdays from 4:00 pm to 9:00 pm. 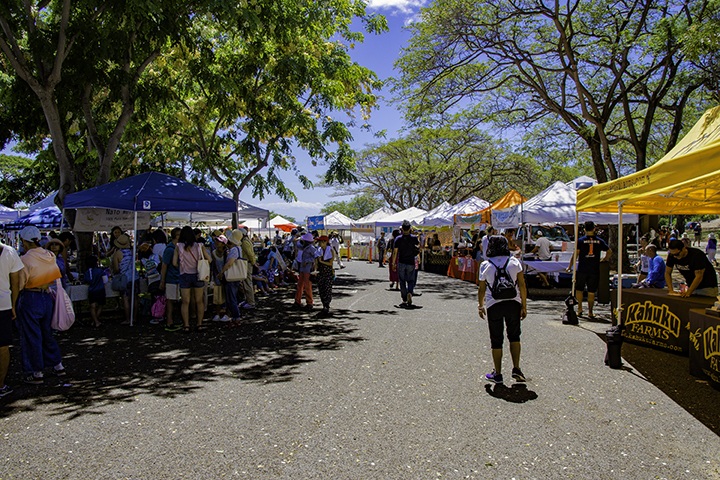 The market is a convenient place for visitors to sample fruits and vegetables and view Hawaiian crafts. There are other farmer’s markets in Honolulu. Closer to downtown are the Makiki Farmers Market, Kaka’ako Farmers Market and People’s Open Market. There are also the Manoa Farmers Market, Kaiser Farmers Market in Hawaii Kai, Hyatt Farmers Market in Waikiki. You’ll find the Pearlridge Farmers Market between Pali Momi Street and the Kamehameha Highway. It’s open every Saturday morning from 8 am to12 pm. Here, you can listen to live music and sample Japanese mochi and lemonades with lilikoi, strawberry or blackberry flavors. It’s also a scrumptious way to introduce your taste buds to Hawaii. The Haleiwa Farmers Market in Waimea Valley is open on Thursday afternoons, from 2:00 to 6:00 pm. Fill a bag with fruits, trail mix and other Hawaiian treats at this North Shore farmers market. Then, you can head out the picturesque waterfall at Waimea Falls Park. If you’re looking specifically for produce, the Waialua People’s Market is for you. It’s open on Wednesdays from 4:30 pm to 7:00 pm and Saturdays from 8:30 am to 2:00 pm. Here, vendors offer tips on food preparation and how to pair drinks with native foods. As part of an historic plantation town, this market would be cultural experience for anyone visiting it. In Kailua, there are two farmer’s markets each week. The Kailua Town Farmers Market at Kailua Elementary School is held on Sundays from 9:00 am to 1:00 pm. While the Kailua Farmers Market on Kailua Road is held on Thursdays from 5:00 pm to 7:30 pm. Here, visitors can find everything from locally grown vegetables to honey, candles and kitchen utensils. Stop by the Windward Mall Farmers Market in comfort of the Windward Mall. People rate it as one of the top farmers markets in Hawaii. Totally enclosed within the mall, it’s a great place to shop especially on rainy or hot days. There are other good farmer’s market outside Honolulu. They include: Mililani Farmers Market, Makeke Kapolei, Mahiku Farmers Market in Ewa Beach, North Shore Country Market near Sunset Beach and the BYU Hawaii Farmers Market in Laie.